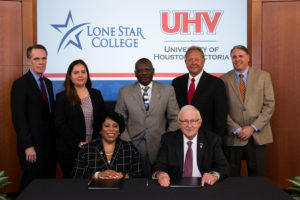 HOUSTON (June 30, 2017) – Lone Star College and the University of Houston-Victoria signed a “Proclamation of Agreement”, creating a transfer pathway for LSC students to earn a Bachelor of Arts degree at UHV. Officials from both colleges, including Dr. Alicia Harvey-Smith, LSC executive vice chancellor; Dr. R. Vic Morgan, UHV president; Richard Phillips, UHV associate provost; and Lance LaCour, Katy Area Economic Development Council, president/CEO, were on hand at LSC-University Park to sign the agreement and officially launch the partnership. The 60x30TX initiative calls for at least 60 percent of Texans, ages 25-34, to earn a certificate or degree by 2030. Other LSC Board of Trustees members in attendance included Dr. David Holsey and Myriam Saldívar, assistant secretary.